Tuna kuwharuwharu (longfin eels) are of great significance to Maori culturally, nutritionally and economically. 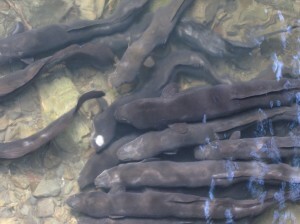 Eels are a significant mahinga kai (food) for Maori, although the dwindling numbers have seriously affected the significance of eels to their diet. They are also used by some iwi as an ecological health indicator to assess water and habitat quality. There exist many stories, artefacts, and songs dedicated to eels, which reinforces their importance to Maori. There are over 100 different tribal names for freshwater eels based on the subtle variations in their characteristics, which is representative of the extensive matauranga (knowledge/science) that exists. This knowledge emerged from the intense observation and interactions to determine the life cycle, habitat needs and migration patterns, and guides Maori as to the sustainable take of a population. Eeling would also occur at “special times of the month and year according to a range of environmental indicators e.g. lunar cycles”3. Maori have also developed sophisticated trapping methods, such as hinaki (eel pots), pa-tuna (eel weirs), patu tuna (eel striking), toi (eel bobbing without hooks), koumu (eel trenches), korapa (hand netting) and mata rau (spearing). Eel weirs were commonly used, however the arrival of settlers and their desire to make waterways more navigable saw the interruption of the use of eel weirs. Maori have customary take rights for events such as hui and tangi, as well as a portion (20%) of the commercial take. However some iwi/hapu are deeply concerned by the dwindling eel numbers have stopped, or significantly minimised, the harvesting of eels.